In a market where yachts are getting longer, wider and heavier, and superyachts are ever becoming super-sized, heavy-duty floating pontoon and breakwater technology helps to shape future-proof marinas. SF Marina, the long established leading designer and manufacturer of concrete pontoons, floating breakwaters and bespoke marinas, uses its experience to continuously push the boundaries of floating technology. 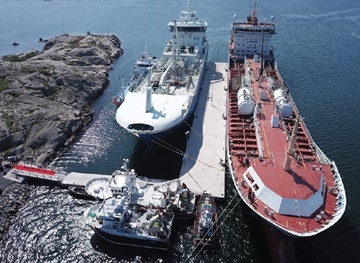 One recent project example, Donsö deep water harbour near Gothenburg, Sweden, draws on the expertise that SF has acquired in the marina sector to create a system for commercial use. In turn, however, the installation reveals the possibilities for floating megayacht pontoon systems in the leisure harbour environment. The Donsö system is designed for fishing and commercial fleets and utilises some of the largest pontoons on the market. The pontoon system is installed in a water depth of 17m (56ft), which means it can safely accommodate vessels with a draught of 10 to 12m (33 to 39ft).